Geography is not only about things that can be seen, touched and measured. Many branches of geography consider how people think, how communities make decisions and how nations interact. At a local scale, one of the characteristics that is often overlooked is sound. We often ignore the soundscapes of places, either because we are “too busy” to listen and take in the local sounds, or because we are “too busy” tuning any distinctive local sounds out while using our cell phones or listening to favorite music. Soundscapes vary greatly from rural areas to urban areas, and from one region to another; Mexico’s urban soundscapes are among the most distinctive on the planet. In previous posts, we listened to The distinctive sounds of Mexico’s towns and cities; covered our ears as we analysed Noise pollution in Mexico; and also described the amazing Whistled language of the Chinantec people in Oaxaca. U.K.-based Chris Watson is a preeminent freelance recordist of wildlife and natural phenomena, whose work has been featured in many BBC programs including David Attenborough’s series, The Life Of Birds. As Watson has remarked, sound recording allows you to put a microphone where you can’t put your ears, to enable you to listen to sounds such as the groaning ice of a moving glacier. His work for the BBC was audio vérité but more recently, including in El Tren Fantasma, Watson has experimented with post production techniques to meld field recordings into a narrative. The result is strangely compelling, dramatic and in some respects, awesome! The soundscapes of El Tren Fantasma (the title is identical to that of a 1927 Mexican movie) offer a trip from the Pacific Coast to the Gulf Coast of Mexico condensed into little more than an hour. 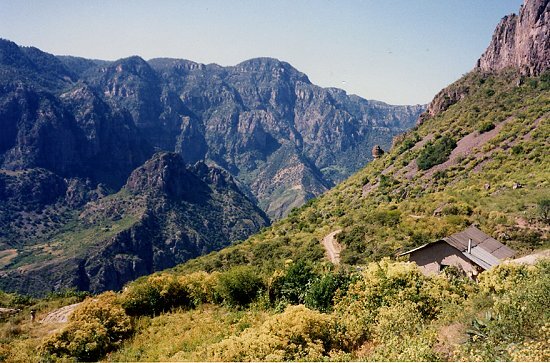 The first six tracks cover the section of railway best known as the Copper Canyon line, one of the few remaining routes in Mexico with regular passenger service. The trip was nicknamed the ghost train by Watson because there are no longer any passenger trains connecting the two coasts. Several years ago, Watson was the sound recordist for a film crew making a program in the BBC TV series Great Railway Journeys. Even then, part of the line was freight only, but in earlier times, there had been regular scheduled passenger trains across the country. Reviews were almost universally positive. El Tren Fantasma offers an extraordinarily evocative sound summary of a trip across Mexico; what a shame that there are now so few passenger services left on Mexican railways! While generally referred to in English as the Tarahumara, the people’s own name for themselves is “Raramuri“, literally “the light‑footed ones” or “footrunners”. The Tarahumara live in the Copper Canyon region of Mexico and are renowned for their long distance running exploits across some of the world’s most inhospitable terrain. As “modern” life encroaches on the Tarahumara and begins to change their traditional way of life, bringing problems like environmental damage, loss of native lands, and narco-trafficking, will they manage to preserve their ancient traditions such as long distance foot races? As his contribution towards helping the Tarahumara preserve their foot races, a few years ago, Micah True, an American better known as ultramarathon runner “Caballo Blanco”, who regularly visited the town of Urique in the Copper Canyon, organized a Copper Canyon Ultramarathon. True, who died in 2012, was featured in Christopher McDougall’s book Born to Run. As True hoped, the Copper Canyon Ultramarathon has become an annual event, now known as the Ultra Caballo Blanco that helps maintain the running heritage aspect of Tarahumara culture. The event is usually held in March. Completing the race requires running an estimated 50 miles (80 km) of tracks, trails and and dirt roads, which start and finish in the main plaza of the town of Urique. The event has become the focal point for a cultural celebration. This short 9-minute Youtube video–Super Athletes of the Sierra Madre–describes the 2009 Copper Canyon Ultramarathon. Ini additional to some great shots of the rugged scenery and the race itself, the video includes brief references to the history of the area, and details some of the current pressures on the Tarahumara way of life. The Copper Canyon ultramarathon is aptly labelled “the greatest race the world has never seen”. The race is not sponsored and there are no huge monetary prizes for the race winners. Donations are accepted to offset the cost of prizes. Anyone who completes the course within the 14-hour time limit is awarded a voucher for 500 lb of corn. Foreign athletes who compete alongside the Tarahumara in this event donate their corn and prizes back to the community. The event attracts more than 200 runners, with about half of them normally completing the course. This image of the course (from Ultra Caballo Blanco) gives some idea of the terrain in which this race is run. 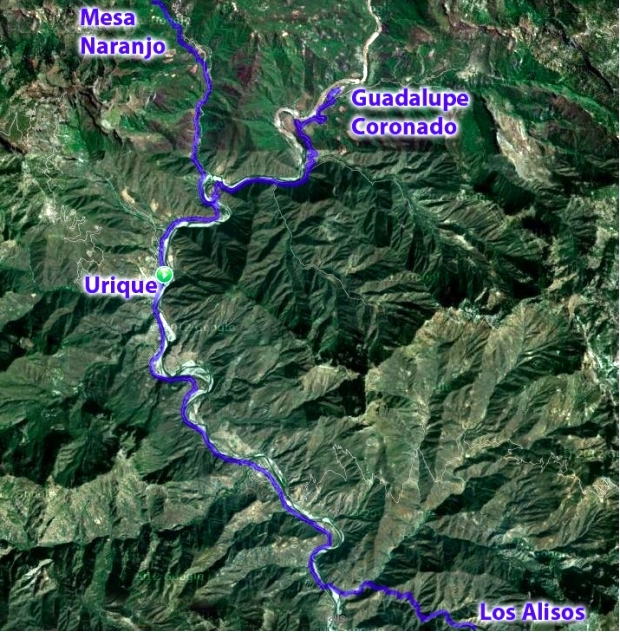 The race starts with a 21+ mile loop up-river from Urique, followed by another 18+ mile loop down-river, and then a final loop (up to the Tarahumara village of Guadalupe Coronado and back down to Urique) adding another 10+ miles to the total distance. The 12th Annual Ultra Caballo Blanco will take place on March, 2, 2014. In the first part of this two-part article – Threats to the traditional Tarahumara way of life, part one – we looked at the threats to traditional Tarahumara life posed by alcohol, deforestation and the construction of new or improved roads in the Sierra Tarahumara (Copper Canyon) area. In this part, we consider the impacts of drug cultivation, mining and tourism. The incursion of drug cultivators seeking land for growing marijuana and opium poppies into the Canyon country has further marginalized the Tarahumara, sometimes labelled “Cimarones” (“Wild Ones”) by the newcomers. Drug cultivators have sometimes registered parcels of land as theirs and then ejected the Indians by force. Obviously, they choose the best available land, and their cultivation methods are designed to produce quick results, rather than sustainability. Alvarado (1996) divides anti-drug policy into various time periods. First came an emphasis on catching those responsible, then came exhaustive efforts to eradicate the crops. Crop eradication has its own serious environmental downside, since it involves the widespread and indiscriminate use of aerially-applied herbicides, alleged to include Agent Orange, Napalm and Paraquat. Alvarado’s study is an interesting analysis of the incredible, quickly-acquired wealth (and accompanying violence and corruption) that characterizes some settlements on the fringes of the Sierra Tarahumara. In some towns, for example, there are few visible means of economic support but the inhabitants are able to purchase far more late-model pick-ups than can their counterparts in major cities. Murder rates in these towns are up to seven times the Chihuahua state average. Violence even has a distinct, seasonal pattern, with peaks in May-June (planting time) and October-November (harvest time). The levels of violence and injustice led Edwin Bustillos (winner of the 1996 Goldman Prize for Ecology) to change the focus of CASMAC, the NGO he directed, from environmental conservation to the protection of Tarahumara lives. In 1994, CASMAC was instrumental in stopping a 90-million-dollar World Bank road-building project that would have opened up still more of the Sierra Tarahumara to timber companies. Besides deforestation and its resultant impacts, mining has had several other adverse effects on the Tarahumara and the local landscape. Mining activity has increased in the past decade as metal prices have been high and the federal government has encouraged foreign investment in the sector. Mining leads to a reduction in wildlife and to the contamination of water resources. The most damaging pollutants are heavy metals. Even tourism poses a potential threat. In the past decade, investments totaling 75 million dollars have been made to improve infrastructure (highways, runways, drainage systems, water treatment facilities, electricity) in the Copper Canyon region so that the area has the hotels, restaurants and recreational activities to handle six times the current number of visitors. The plan includes three remodeled train stations and a cable car that is already in operation. Sadly, the Tarahumara were not consulted. The plan essentially deprives them of some communal land with nothing being offered in exchange. Clearly, they are in danger of losing control over even more of their natural resources, especially since improved highways will benefit other groups such as drugs growers. Anthrologist María Fernanda Paz, a researcher in socio-environmental conflicts at UNAM’s Regional Center for Multidisciplinary Studies, argues that these recent conflicts in the Copper Canyon region have stemmed from the federal government’s support for inflows of foreign capital, helped by modifications to the land ownership provisions enshrined in article 27 of the Constitution, changes made in 1992 during the administration of President Carlos Salinas de Gortari. In her view, the developers behind contentious projects first do everything possible to hide the project from public view until it is well advanced. Once people start to object, they then identify the community leaders and do everything possible to get them on their side. Before long, they have succeeded in creating a massive rift in the community, paying some very well indeed for their land, and others next to nothing. The Tarahumara recently (12 March 2012) won one of the greatest victories to date for indigenous peoples in Mexico. The Tarahumara (rarámuri) community of Huetosachi in the state of Chihuahua has now been recognized by Mexico’s Supreme Court as having long-standing indigenous territorial rights (but not formal ownership) that must be respected by the Copper Canyon Development Fund (Fideicomiso Barrancas del Cobre). This is truly a landmark victory. The Tarahumara have been guaranteed the right to be consulted over all Development Plans, and to select the benefits they will receive in exchange for any loss of ancestral territory. Finally, this juggernaut of a tourist development plan must respect the territories and natural resources of the Tarahumara. This was truly David against Goliath. Huetosachi is a tiny settlement of only 16 families, about 10 km from where the main tourist complex is being built near the Divisadero railway station. The village has no water, electricity or health services. The Copper Canyon Development Fund is now obligated to create a Regional Consultative Council allowing the villagers of Huetosachi and other settlements a say in the negotiations to decide what level of development is acceptable, and what the villagers expect in return. This council is expected to include representatives of 27 indigenous communities in the immediate area between Creel and Divisadero. This landmark court decision could well be the first of many as indigenous groups elsewhere in Mexico fight their own battles against developers of various kinds. There could still be more court cases concerning the Copper Canyon region since it is widely expected that this initial success will lead to a legal challenge against the siting of the cable car. The villagers are also reported to be discussing how best to deal with water contamination allegedly resulting from existing hotels, and the possibility of a golf course being built on the canyon rim. The extreme isolation of the Tarahumara (until recent years) and their adaptation of some elements of the alien Spanish/Mexican culture have enabled them to survive in what most observers would regard as an extraordinarily hostile natural environment. The effects of this isolation are reflected in their culture, in their relatively equal gender roles in terms of their economy, their flexibility of work schedule, lack of economic specialization and their willingness to share available food when necessary to ensure survival. Their isolation has also hindered the emergence of any well‑defined leadership system. A lack of any “official” hierarchy make it much more difficult to resolve any serious disputes. It has also meant that the shy and politically naive Tarahumara have found it difficult to counteract intruders, whether they are government officials or drug‑dealers. As more roads are improved, even the furthest, most remote sanctuaries, of the Tarahumara come under threat. Some Tarahumara have adopted more mestizo culture than others; the “gentile/baptized” distinction, first recognized by Lumholtz, with all its associated differences in settlement patters and lifestyle arose from the resistance of many Tarahumara to the imposition of a Spanish/mestizo culture that they considered “alien”. The more traditional Tarahumara still prefer to live in relative isolation and not to resettle into fixed villages where there would be insurmountable pressure on their culture. The mestizos in the Copper Canyon region, who occupied the best land by force and formed villages in the European‑derived tradition, have far more links with modern Mexico, and have preserved their economic dominance over the Indians. None of this means that the traditional Tarahumara way of life has remained unchanged or will not continue to undergo modifications in the future. Any changes to the environment can have serious adverse impacts on their abilities to find sufficient food. The main drivers of environmental change have been drug-growing, forestry, mining and tourism. In addition, they have to manage changes which, to some extent, have been thrust upon them by some of the government and other efforts aimed at helping them. For example, modern medicine and education threaten to change the Tarahumara population balance. Today, more infants survive to adulthood and fewer adults die as a result of accidents. The problem for the Tarahumara is how to feed and support an ever‑growing population using existing methods of cultivation and herding. Equally important is the transformation of the traditional Tarahumara system of wants by contact with mestizos. Prior to these contacts, the Tarahumara had little or no access to commercially-made alcohol. Tarahumara tesgüino took considerable time and effort to make and had to be consumed rapidly, meaning that Tarahumara could get drunk occasionally, but could not remain drunk for long. The ready availability of commercial alcohol has completely changed this dynamic. Slightly over a decade ago, an innovative, women-led project reportedly changed the 3500-inhabitant community of Arareco (8 km from the town of Creel) for the better. Kari Igomari Niwara, a 200-member women’s organization, began in 1992, and is celebrating its 20th anniversary this year. It has often been quoted as an outstanding example of what the Raramuri (Tarahumara) can do if left to their own devices and allowed to control their own resources. In this project, they have sought encouragement and support, rather than direction and dependence. By 1997, Kari Igomari Niwara had organized a health center, primary school, bilingual literacy program, drinking water system, bakery, three small food supply stores, a handicrafts business, a restaurant and collective transportation for the village. One of the first collective efforts of the Kari Igomari Niwara group was to get the cantinas (bars) of Creel closed at 4pm in the afternoon, so that their husbands wouldn’t get so drunk. Almost 70% of Arareco women reported having been beaten by their husbands, the vast majority of attacks coming when their husbands were drunk. After the initial cantina victory, the men became even more repressive, but the women persisted and four years later managed to persuade the church to build them a small health center despite the objections of their local male-dominated council. The women have already reduced nutrition-related infant mortality to 25% of its former level and have brought birth rates down by 50% (Nauman, 1997). The deforestation of the Copper Canyon region has a long history and has significantly changed the resource base of the Tarahumara to the point where their traditional way of life in the canyons is probably impossible to sustain in the future. Deforestation was started by mining companies who cut trees to make pit props and burn as fuel. In the 1890s, the region started to supply timber to the USA, via concessions given by Chihuahua state governor Enrique Creel to companies such as the Sierra Madre Land and Lumber Company, owned by William Randolph Hearst. Today, many of the local ejidos continue to cut more timber than they can ever replant, and there are more sawmills in operation than could ever be sustainable. In many places, there are clear signs of the immense environmental destruction wrought by timber cutting, often on slopes so steep that there is little chance of reforesting them in the future. Soil erosion is rampant in some areas and satellite imagery reveals huge areas that are no longer forested. Recent droughts have not helped, and one NGO, Alternative Training and Community Development (ALCADECO) has explored their links with deforestation and migration. The NGO’s director, Laura Frade, argues that the long-term effects of drought go far beyond the obvious. Poor crops in times of drought results in the abandonment of traditional lands. Families become dependent on poorly-paid jobs in the timber industry, or on drug plantations, or dependent on the sale of handicrafts to tourists. Many of those that fail to make ends meet then become the unwilling recipients of blankets and food from charity organizations. Others move to cities like Chihuahua, where they try to survive by begging or turn to alcohol. The development of forestry required the development of roads and vehicle tracks. Road development continues to this day and is not necessarily a beneficial thing. Improved road access has opened up new areas for lumbering, mining and tourism. In turn, small stores spring up, even in remote areas, selling mestizo items such as radios, carbonated drinks, cigarettes, and manufactured clothing. The use of money has become more widespread. Better roads have enabled traders to build a credit relationship with Tarahumara Indians, offering them non-traditional goods in exchange for a share of the next maize harvest. This has led to typical problems of indebtedness and exploitation. A cave dwelling known as “Cueva del Chino” is located a short distance from the Posada Barrancas railway halt, very close to the present-day location of the Posada Barrancas Mirador hotel. When I first visited this cave, in the mid-1980s, I was struck by the obvious dangers of living so close to a precipitous drop. The cave is on a very narrow ledge, some 20 meters or so below the canyon rim. There is a local spring which acts as a water supply, though it is perhaps not always a reliable year-round supply. Outside the cave is a tangle of vegetation, much greener and more varied than elsewhere along the canyon wall. It was only on my second or third visit to this cave that I realized that this unruly vegetation was not only due to the nearby natural water source, but also due to the assiduous work of the cave’s residents. The tangled vegetation was actually a very productive garden, offering a variety of vegetables, fruit and herbs. Put simply, who really wants to work harder than necessary? Cueva del Chino, with “garden” on the left, 1989.Copyright Geo-Mexico; all rights reserved. Cueva del Chino, 2003 [from the opposite angle]. Copyright Geo-Mexico; all rights reserved. The photos show the truly astonishing changes that took place in this cave dwelling and garden between 1989 and 2003. The major change in the area between those years was the construction of the Posada Barrancas Mirador, only a few steps away from the path leading down to the cave. This has led to a steady trickle of visitors who buy the locally-made pine needle basketwork (top photo) or leave behind a few pesos. Are these changes really for the better? There are arguments on both sides, and I’m honestly not entirely sure. I haven’t been back for several years, but would welcome an update (and photo) from any Geo-Mexico reader who happens to visit. At the time of the Spanish conquest, the Tarahumara were hunter‑gatherer‑cultivators, collecting what they could from local trees and plants, and using a version of shifting agriculture to produce crops of corn (maize), beans and squash. Their methods of farming were probably well‑ adjusted to the then-prevailing environmental conditions in the Copper Canyon region and caused little soil degradation. With the arrival of the Spanish, the Tarahumara were forced to occupy progressively more marginal land where their traditional methods were unable to supply enough food for their numbers. However, the Spanish introduced them to new crops, new animals (goats, cows, sheep) and new techniques, principally the plow. Adopting these innovations enabled them to survive despite being deprived of their best land. A reduction in the arable area available prevented them from continuing to grow crops by shifting cultivation. On the other hand, their newly acquired animals afforded them the possibility of adding manure to their farming plots on a regular basis, keeping them under cultivation more continuously than was previously possible. For manuring purposes, herds of 15‑50 goats are penned into square enclosures (6 m x 6 m in size) each night for four nights. The pen is then moved. The method is slow but effective. Plots of land fertilized by this method give good yields for between 4 and 6 years. Cattle (5‑15 at a time) are also used to supply fertilizer but have to be kept on the same area for 15 nights, for an effect which lasts about three years. In wintertime, stock is usually confined to caves or covered enclosures. The manure deposited is collected and transported in sacks to the farming plots in spring. A simple rotation system is used with about 25% of available land left uncultivated in any one year. Animals may be loaned out to other families for the purposes of land fertilization, or pooled together to ensure effective results. The Tarahumara tilled their plots using a simple digging‑stick, which could be used with minimal risk on tiny plots of land, even on steep slopes. Following the adoption of the plow, it was much easier to cultivate larger fields on lower angle slopes, rather than smaller, steeper plots, principally because the plow disturbed the soil far more “efficiently” and to greater depth than the digging‑stick. On the other hand, the vegetation of the steep hillsides was subsequently left undisturbed. Given the terrain, pasture is hard to find. Near the smaller settlements (ranchos), natural pasture exists only for a very short time during the rainy season. At other times the herds have to be taken ever greater distances in search of richer pickings. This has traditionally been done by the children, leaving the adults free for other tasks. Trips to find suitable pasture may last two or three days at a time. Despite the difficulties of providing livestock with sufficient food, the animals provide a hedge against starvation, and are a measure of Tarahumara wealth. The balance between crops and livestock is critical to the Indians’ well‑being. This was not the case before the mestizos moved in and pushed the Tarahumara onto more marginal land, but it is today. The Tarahumara agricultural calendar lasts about seven months, beginning with planting, at the end of April or in early May, and ending with harvesting, during late October, early November. The planting date is determined by the phase of the moon, rumors of rain, offers of help, and by personal tradition. For a good maize crop, the plants should be about 30 cm high when the first heavy rains fall. The timing and duration of the rainy season is crucial to the success of the crop. Climatic uncertainty is compounded by the effects of pests and diseases. Many plants are damaged by a kind of worm but the Tarahumara believe they should be left alone since otherwise the entire crop will be lost. Immediately before the rains, many families are down to their last reserves of food, and many animals have to be slaughtered both for survival and to placate the Gods. The young plants need a lot of vigilance to prevent animals from destroying them. This responsibility is shared among family members since the individual plots of land belonging to one family are so widely scattered. The adults will occupy themselves with mending and craft‑making while keeping an eye on the crops. Towards the end of July, the young corn is weeded in a communal work effort, amidst general merriment, a sign of relief that next year’s food supply is well on its way. Beans are planted in early August. Harvesting takes place in late October, early November. When about half of the maize has been harvested, corn beer (tesgüino) is prepared, the rest of the harvest becoming a communal or cooperative effort. Some Tarahumara practice transhumance, moving down to the canyon floors in winter for better shelter and access to pasture. However, many Tarahumara, especially the more Mexicanized, stay in one place all year, lighting fires and wearing warmer clothes as their protection against the cold. The winter time is when men make musical instruments (guitars, violins and mouth harps), and the family collects firewood, tends the goats and make baskets and other items, some of which will be sold to tourists. Bennett, W. and Zingg, R. (1935) The Tarahumara. Univ. of Chicago Press. Reprinted by Rio Grande Press, 1976. Kennedy, J.G. (1978) Tarahumara of the Sierra Madre; Beer, Ecology and Social Organization, AHM Publishing Corp, Arlington Heights, Illinois. 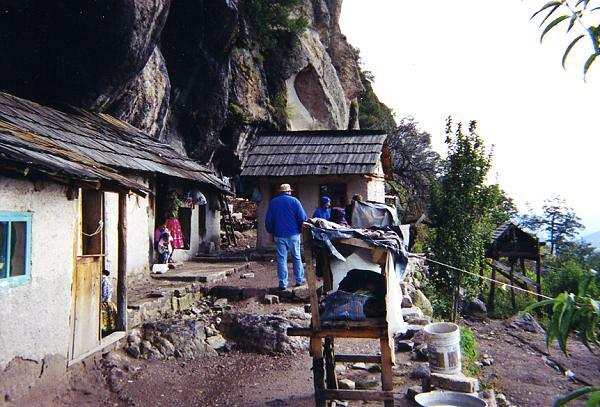 Republished, as The Tarahumara of the Sierra Madre: Survivors on the Canyon’s Edge in 1996. Pennington, C. (1963) The Tarahumar of Mexico, their environment and material culture. Univ. of Utah Press. Reprint by Editorial Agata, Guadalajara, 1996. To understand the distinctive settlement patterns of the Tarahumara today, we first need to romp through a thumbnail history covering their experiences during the years following the Spanish Conquest. While it is uncertain precisely when the Tarahumara arrived in this area, or where they came from, the archaeological evidence seems to support the view that they probably only arrived a short time before the Spanish reached the New World. By 1500 A.D., the Tarahumara had stone dwellings, simple blankets of agave fiber, stone “metates” (pestles), and combined hunting and gathering with the cultivation of corn (maize) and gourds. Settlements at this time would have been small and scattered, with no more than a few families able to survive in any given area. Then the Spanish arrived. In early colonial times, Spanish explorers and clerics gradually moved ever further north of Mexico City. The first twelve Jesuits had arrived in New Spain in 1572; more arrived in 1576 and by 1580, they had already established centers for their work in Michoacán (1573), Guadalajara (1574), Oaxaca (1575), Veracruz (1578) and Puebla (1580). However, the inaccessibility of the Copper Canyon area prevented them from extending northwards as fast as they had hoped.The first important Spanish contact with the Tarahumara dates from around 1610 when a Jesuit missionary, Juan Fonte, established a mission at San Pablo de Balleza. This mission, located between the traditional territories of the Tarahumara and the neighboring Tepehuan Indians, was short-lived. In 1616, a Tepehuan‑inspired revolt led to Fonte’s death. Several hundred Spaniards along with thousands of Indians were killed in the ensuing two years of conflict. During the remainder of the 17th century, however, the Jesuits made a steady advance, establishing numerous missions including Sisoguichi, which is still the center of their influence today. These Jesuit missions were a clerical modification of the encomienda system, an institution designed to help spread Spanish civilization, by rewarding chosen settlers with the right to collect tributes and labor from the indigenous population. The Jesuit missions usually had two friars teaching religion, handicrafts, agriculture and self‑government, together with a few soldiers for protection. As early as 1645, some Tarahumara were working in mines, some as slaves, others voluntarily for wages. This is when both the Jesuits and the mine operators encouraged the Indians to relocate and concentrate their homes in villages or towns. This major change in settlement pattern facilitated the provision of religion and education and made it easier to organize the labor force. The Tarahumara resisted this move more strongly than other indigenous groups did elsewhere in New Spain. The early Jesuit/Tarahumara contacts were relatively friendly, but disillusionment soon set in and around 1650 the Tarahumara essentially split into two opposing factions, the “baptizados” (Christians) and the “gentiles” (unconverted). The former decided that the priests offered a worthwhile alternative to their traditional way of life and remained in the missions. The gentiles, blaming the Spanish God for widespread epidemics, withdrew into the difficult terrain of mountains and canyons of the Copper Canyon region, effectively trying to avoid any further contact with the Spanish. Later rebellions by the gentiles , such as that in the 1690s, were brutally put down by Spanish troops. This ended Tarahumara military resistance but ensured that they withdrew still further into the canyons. The two groups of Tarahumara now have very different settlement patterns, and some significant differences in their way of life. The baptizados live in mission villages, many of which are located east of the true canyon region, where valleys offer ample arable land and better possibilities for highways and communications. The settlements are nucleated, with homes built close to the protection of the church, and farmland surrounding the villages. These villages attracted many mestizo settlers, who saw opportunities in agriculture, forestry and commerce. Intermarriage became more common and the Tarahumara’s social customs changed as they assimilated more mestizo habits and became more Mexicanized. The largest settlement in the region is Creel, a much more modern town, founded in 1906. The town received a massive boost following the completion of the railway between Creel and Chihuahua in 1907, and again in the 1960s when the “Copper Canyon” railway to Los Mochis and Topolobampo was finally completed. 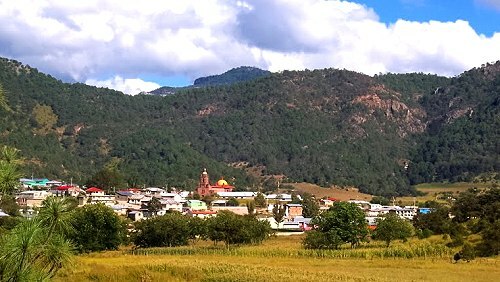 Creel has also benefited in the past decade from its designation as one of Mexico’s Magic Towns and has received significant investments in tourist and urban infrastructure. Set at an elevation of 2340 m (7,600 feet) above sea level, Creel lies some distance from the nearest canyon, but has become the main marketing, lumber and tourist center and the gateway for trips into the more remote areas. Its population is about 6500. The traditional Tarahumara, the gentiles, are less Mexicanized, though they continue to use introduced crops, animals and agricultural implements acquired from the Spanish priests and settlers. Restricted to marginal land on the canyons’ rims and walls, they live in small, variable‑sized, dispersed settlements, often several hours apart by foot. This pattern is no surprise, given the extremes of topography that characterize the area, the limited technology (plow agriculture) available to them, and their need for spatial mobility to ensure access to grazing land for small herds of sheep and goats. In these marginal areas, only small pockets of potentially arable land exist and many families have plots of land scattered about a considerable area, with several hours’ walk between plots. 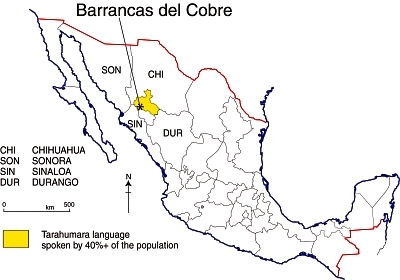 The population of their dispersed settlements (ranchos) is variable, depending on the available resources of land and water, on the pattern of marriages, and on the amount of inherited land in other ranchos, but averages between 2 and 5 family groups, a total of between 10 and 25 individuals. The serious challenge is finding any land suitable for farming. Photo: Tony Burton; all rights reserved. The homes are often perched on the gently sloping tops of the steep-sided spurs that jut out from the canyon rim, affording spectacular views, but with dangerous drop-offs beyond the areas suitable for settlement and cultivation. Individual dwellings used to be stone and mud huts, or caves in the canyon wall. The Tarahumara’s skill with the axe (a 17th century introduction) is considerable and, today, houses and other structures are made almost entirely of wood, though many caves are still inhabited, at least for part of the year. Caves which face south are preferred and their position on distant hillsides is often marked by a black, smoke‑darkened upper rim. Perhaps the best‑built structures are their storage boxes which are wooden cubes (side about 2 m) where notched hand‑hewn planks are fitted together so tightly that not even a mouse can gain access. 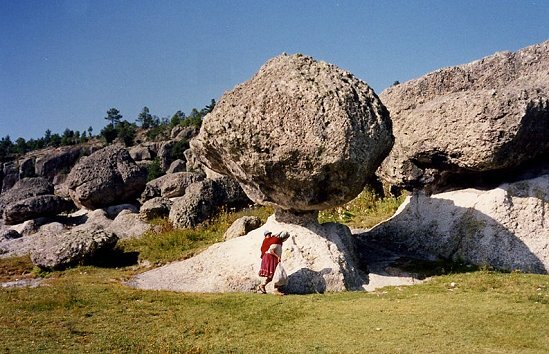 These structures are raised about 50 cm off the ground, usually on boulders, and have wooden roof singles. They are used to store not only food but also animal hides, horsehair ropes, simple implements, cloth, yarn and anything considered valuable. Where wood is harder to obtain, they are built of stones and mud. Their houses are constructed in a similar fashion, but with less attention to detail. Their houses are not, therefore, very permanent. Indeed, one ancient Indian tradition holds that when a member of the household dies, the house should be abandoned or destroyed. Nowadays, the family simply moves the structure a few hundred meters and rebuilds it. The houses have dirt floors and minimal furnishings, such as wooden benches and stumps, items for food preparation, metal plates and a bucket and some animal (goat or cow) skins for sleeping on. There may also be some rough blankets and a homemade violin. Most gentiles have more than one dwelling since they wander far afield with their animals in search of pasture and food, and since many practice a form of transhumance, spending winters near the canyon floor and summers near the canyon rim. Kennedy, J.G. (1978) Tarahumara of the Sierra Madre; Beer, Ecology and Social Organization, AHM Publishing Corp, Arlington Heights, Illinois. 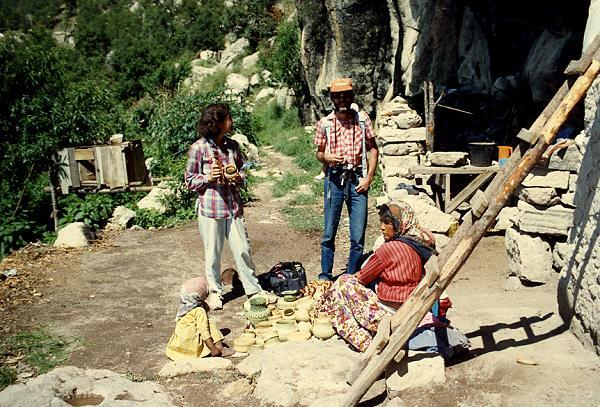 Republished, as The Tarahumara of the Sierra Madre: Survivors on the Canyon’s Edge in 1996. This anthropologist lived in one of the more remote Tarahumara areas for several months, accompanied by his wife and infant daughter. Lumholtz, C. (1902) Unknown Mexico. 2 volumes. Scribner’s Sons, New York. Republished in both English and Spanish, this is a fascinating ethnographic account dating back to the end of the 19th century. Pennington, C. (1963) The Tarahumar of Mexico, their environment and material culture. Univ. of Utah Press. The reprint by Editorial Agata, Guadalajara, 1996, of this classic account of Tarahumara life and culture is embellished with wonderful color photographs, taken by Luis Verplancken, S.J. (1926-2004), who ran the mission in Creel for many years. Other Comments Off on How were the canyons in the Copper Canyon region formed? The Copper Canyon region in Mexico is the informal name for the area, in the south-west part of Chihuahua state, where several deep canyons bisect the Sierra Tarahumara. The 10,000 km2 area, part of the Western Sierra Madre, is home to about 50,000 Tarahumara Indians, one of the largest native Indian groups in North America. While generally referred to in English as the Tarahumara, the people’s own name for themselves is “Raramuri“, literally “the light‑footed ones” or “footrunners”. While the Tarahumara have so far succeeded in keeping many aspects of their distinctive culture relatively unadulterated, the pressures on them have increased considerably in recent years as improving highway links have made the region more accessible, not only to tourists, but also to developers looking to exploit the region’s forest and mineral resources. 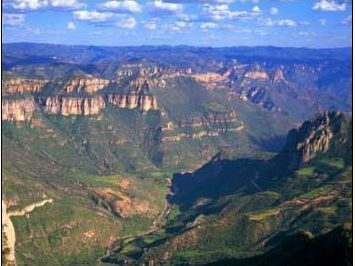 Spanish-speakers usually refer to this region as the “Barrancas del Cobre” (Copper Canyons, plural). The table shows the seven main canyons, only one of which, strictly speaking, is the Copper Canyon. The precise number of canyons depends on whether they are defined by rivers or by local names since different stretches of canyon along a single river have sometimes been given different names. The major canyon is the Urique Canyon. This is the one seen by most tourists because it is the closest to the railway line that traverses the region. Both the Urique River and the Batopilas River flow into the River Fuerte, which enters the Gulf of Mexico near Los Mochis. The Tarahumara have very few place-names. They do not usually have identifying names for specific mountains, streams, trails or landmarks , but do give names to every small settlement, even if it only consists of two or three homes. These names serve to distinguish one family from another, but a single family may have several farms, each with a different name. The Tarahumara do have “a rather complete terminology for plants, animals, and birds.” [Bennet & Zingg, 1935] The place-names for settlements are usually two-part names, consisting of a descriptive name plus a place suffix. Aworítci, from aworíki, “cedar tree” (tci gives idea of a grove of trees). Tcimétabo, from tcimáka, “leather money bag”, plus –tabo, place-ending. In future posts, we will delve further into the geography of the Copper Canyon region and the lifestyle of the Tarahumara Indians. Can the Tarahumara Indians who live in Mexico’s Copper Canyon region survive? 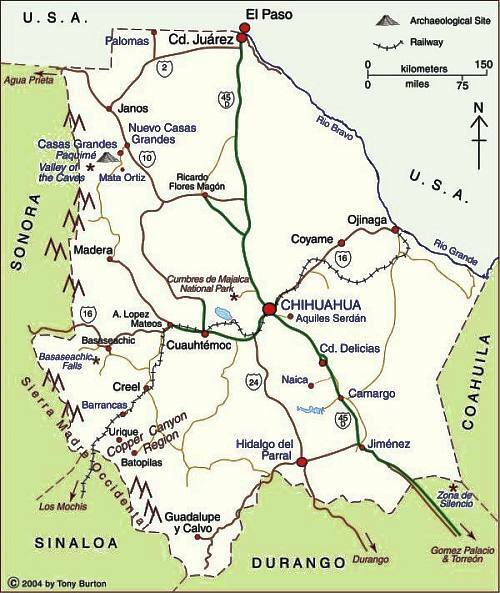 The map shows the state of Chihuahua in northern Mexico. The state capital is the city of Chihuahua (2009 population: 839,000) . Chihuahua is the largest state in Mexico in area: 247,087 square kilometers (95,401 square miles). The state’s population is 3,422,047 (CONAPO 2010 estimate). Cd. Juárez is the state’s largest city and Mexico’s 8th largest city with a population of about 1.4 million. In recent years, the city, across the border from the US city of El Paso, has gained considerable notoriety on account of its violence and high murder rate. It also faces air pollution issues, discussed in chapter 23 of Geo-Mexico: the geography and dynamics of modern Mexico. Map of Chihuahua. Copyright 2004, 2010 Tony Burton. All rights reserved. the Copper Canyon region (narrower, deeper and longer than the US Grand Canyon) which is home to the Tarahumar Indians, an indigenous group with a particularly distinctive lifestyle. 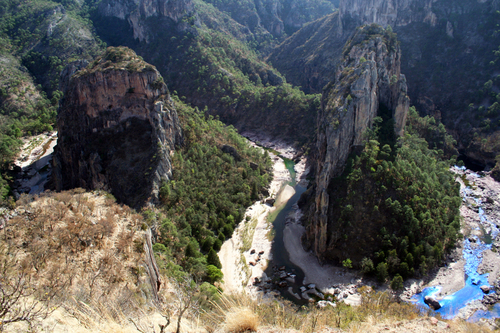 The Copper Canyon and Tarahumar Indians are discussed in chapters 13, 17 and 19 of Geo-Mexico. A world-famous tourist train traverses this region. Mexico’s two highest waterfalls, the Piedra Volada Falls, where the water tumbles 453 meters (1,486 feet) and the Basaseachic Falls, which are 246 meters (807 feet) in height. The Piedra Volada Falls, which are seasonal, are not shown on this map, but are a short distance north of the Basaseachic Falls. Click here for the interactive version of this map on MexConnect website.